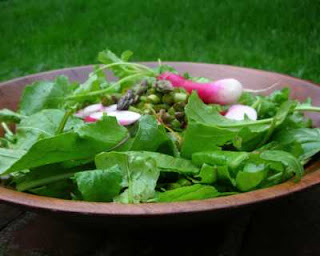 Today's vegetable salad: An easy salad, made with thin spears of raw, yes raw! asparagus, then tossed in a simple vinaigrette. Low carb. Weight Watchers 1 point. 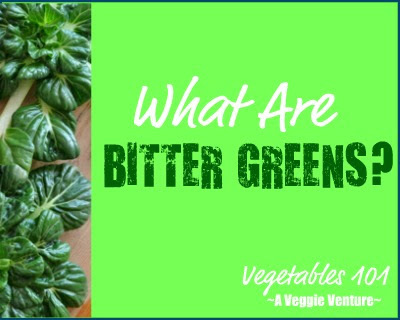 Regular readers know that a certain 'veggie evangelist' is prone to rhapsodizing about vegetables. But -- oh my -- how did I ever miss raw asparagus? The inspiration for raw asparagus came from the lovely food blog Kitchenography, who recently made a mâche salad with raw asparagus, pistachios and Parmesan (how great does that sound?!). I didn't follow that recipe nor any other, but instead tossed together my own raw asparagus salad and then slipped it into arugula and mixed greens from the Maplewood farmers market. (Thank you, Schlaffly Beer, for hosting a mid-week market! For St. Louisans, it's held on Wednesdays, 4 - 7 pm at the Schlaffly microbrewery in downtown Maplewood.) But I'm ever grateful to Julie for turning me onto the idea of raw asparagus. This raw asparagus salad is kid friendly! 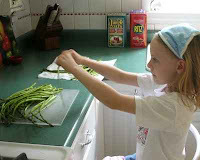 Here's my seven-year old neighbor learning to 'snap' asparagus like a pro. She then whisked the dressing, tasting each ingredient we added. When we sat down to taste, she declared our asparagus salad "good"! Wash the asparagus well, especially the tips where grit can accumulate. After washing, place on a double layer of paper towels to siphon off water. (This is so the oil/vinegar dressing can adhere.) Snap off the woody ends and discard. Line up the tips of as many asparagus as you can manage, cut off the tips. (Use these in the salad itself or save for something else where the tips are so coveted.) Cut the asparagus in tiny bits, maybe 1/8 or 1/4 inch lengths. Whisk the olive oil, balsamic vinegar, salt & pepper, lemon zest (don't forget to reserve a few for garnish). Stir in the asparagus. Toss the asparagus with the greens. Serve immediately. It's likely that an over-the-top-good raw asparagus salad is dependent on the right collection of ingredients: very fresh tiny-thin spears of asparagus, great olive oil, great balsamic vinegar. To my taste, as well, the lemon zest is essential. The asparagus bits do tend to drop to the bottom of the salad bowl so if presentation is important, think about dressing the greens separately, arranging on plates and then topping each plate with the raw asparagus -- and a few strips of lemon zest, for extra prettiness! UPDATE Try adding some sliced strawberries and going heavy on the pepper: double gorgeous! Yes, yes, I do love this idea. I've noticed that when I'm cutting the asparagus I always eat some raw, so it makes perfect sense. There's nothing more satisfying than eating fresh, raw asparagus. This sounds like a perfect way to enjoy them! Really like your short hand recipe! I'm with Kalyn here, I enjoy a bite or two of the raw as I prepare it so why wouldn't it be just great like this. Thanks for the mention. Your salad looks elegant and your kitchen assistant is cute as a button. Oh Alanna, that looks delicious! I have some asparagus in the fridge and I just may try this for lunch. And good for you for finding such a great assistant! Kalyn ~ Me too! What we've been missing! Homesick ~ Aha. Who knew? YOU knew! Tanna ~ Thanks! The shorthand recipes actually are kept in a (growing) Word document that goes with me into the grocery store, also when I travel and know there'll be kitchen duty. Julie ~ You're so welcome. And truly, thank you for the introduction to raw asparagus! 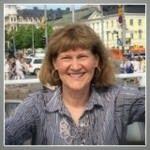 Susan ~ Don't you just love recipes that send you to the kitchen? How odd, I don't think that I've ever tried asparagus raw! After seeing this recipe, I'll rectify that little over-sight. btw, thanks for the reminder about Clotilde's book, I've got it on my wish list! I saw Julie's recipe and loved it. Now, I love yours too! What am I waiting for to make my own? Funny, when I'm cutting the asparagus I always eat some raw, but never thought of making a salad from raw asparagus! Great idea! Just clicked on the recipe after viewing the tofu salad on one slice of bread recipe. Before the county decided to widen our roads, we had asparagus growing in our ditches. Each spring we foraged for the wild asparagus (sounds like a name for a book, doesn't it?) When hubby was with, it got to the kitchen....when he wasn't, well it was 'iffy' if it got to the kitchen, lol. Most ended up in the tummy before the feet entered the house door. I have been doing that for years, and when I tell people to eat it raw, they look at me as if I had recommended them to commot cannabalism! Seriously! Nothing better than raw asparagus. Sadly, my wild patch in the ditch is no longer there. I miss it. Maybe I should plant more here and there and in three years forage again. Trouble is that the county comes along and sprays herbicide, and even though I have a standing order for them to skip our ditch, some times the "I will live for ever" young man ignores the edict and sprays anyway. So my asaparagus patch had better be in the farm yard where I can control that lousy spraying rule and young man-person.